Jalisa Haggins explores the perception of race and stereotypes in her series entitled “Strange Fruit,” which references the song performed by Billie Holiday. The protest ballad had been originally written as a poem in 1936 by Abel Meeropol. Expand your palette by taking in some “Strange Fruit” at Urban Roots (322 N.E. 2nd Street) in Deep Deuce. Jalisa Haggins’ artistic arrangement was installed at the café, bar and performance space on Friday, Aug. 3. Haggins’ art will be on display until September 29th. While Urban Roots is not an art gallery you just walk into, the art work is available to view during other events being hosted in the space, like on Jazz night for instance . The display was a bit sparse, either by design or due to unforeseen technical difficulties. 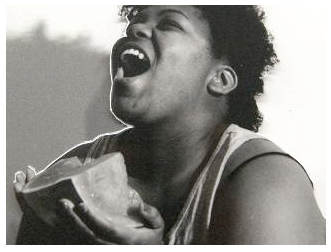 One of the reasons behind the exhibit’s name, “Strange Fruit,” is apparent in the nine-photo series, which features the artist eating watermelon. There are three sets of three poses where varied lighting shifts the focus from form to content. The repetition of the same photo three times caused me to consider what was being portrayed over how. Watermelon was a good choice of fruit because it’s awkward to eat and messy; and because the idea of photographing it seems overstated. The artist’s poses further complicated that line of thought because she is portrayed laughing boisterously. Through the prints, I saw many deeper questions about awkwardness, stereotype, exaggeration, and happiness as those questions pertain to the subject of the photos – a woman of African American descent. If the whole exhibit consisted of simple and yet profound visual statements like that, I would have been fully engaged. Unfortunately, for me, the other photos on display left much to be desired. Other images portrayed the artist superimposed into various scenes. One appeared to be an episode of Soul Train or some other television appearance of African Americans in the 1970s. One could have been a movie scene with a white woman looking superior to Haggins, who was posed as a maid or slave, complete with a white smock and head wrap. In that series, which included two other photos, the technique seemed to overpower the message. I couldn’t get wrapped up in the portrayal of a young Black woman in a subservient role because I kept wondering if Haggins used Photoshop to insert herself into the scene or if the process was more intricate than that. But it could be said that the prints were strange, which is in keeping with the exhibit’s theme. The video she produced, which used a similar technique, was much more engaging. Haggins wore an ensemble reminiscent of the 1940s and learned the choreography and words to a musical number by some Greta Garbo or Ginger Rogers type of character. She superimposed herself performing the musical number on top of the original video. Unlike the still photos, this created an abundance of juxtaposition between the artist, a plus-sized and dark-skinned African American, and a pale, thin, light-haired movie star. I was fascinated by everything about it and the strangeness had me considering not only race but body composition and society’s ideas of acceptable expression and propriety. The last major piece, Haggins described as a web of circumstances and ideas, good and bad. In the center of dozens of clear push-pins was a 2 by 3.5 inch piece of stock paper labeled “Race Card” and featured four small boxes in white, brown, yellow, and black. A continuous piece of tan twine had been wrapped in a complicated pattern around all the push-pins which held dozens of labels like “criminal defense,” “section 8,” “voting,” “movies,” “clubs,” “spousal abuse,” “school suspensions,” “adoption,” and “public transportation.” Of course there was no further explanation for the meaning for these words in relation to the “Race Card” except the line of string between one idea or circumstance and the next. I futilely attempted to make a connection between each idea and the ones tied to it in either direction. I think that was the point, and it was a brilliantly executed one. Perhaps the relationship between race and “partying” is inexplicably connected to “history” and “health.” Perhaps you can’t help getting lost trying to read between the lines. I heard another onlooker mention that the connections – real and perceived – between the ideas vary not only based on each person’s perspective, but also on the different races the card represented. While I can’t say that this was my favorite art exhibit, or even the best I’ve seen at Urban Roots, I think Haggins was effective in causing viewers to pause and ponder. Urban Roots was a great setting for this exhibit, although two more of Haggins’s videos were shown at the Independent Artists of Oklahoma Gallery. The 1950s era jazz and big band music set the tone for a look at race throughout the century, not just today or in the era of Jim Crow. The strangeness of execution, whether intentional or amateur, was more hit than miss even though it was not my cup of tea. Tagged Abel Meeropol, African American, cs, Jalisa Haggins, movie, Photography, Race, Race Card, Soul Train, space, Stereotypes, Strange Fruit, Urban Roots, video. Bookmark the permalink.